Legion Bike Ride 2, this Sunday. 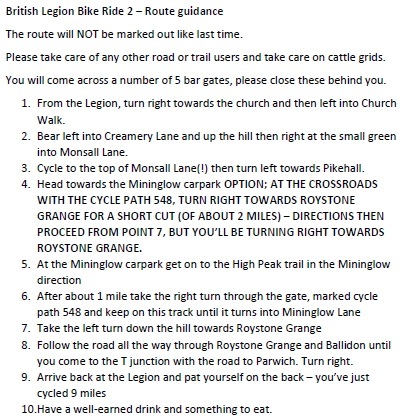 Due to popular demand, we’re running a second British Legion bike ride, with a variation to the route we did last time. It’ll be 9 miles with a mixture of roads and trails, leaving at finishing at The Legion. The start time is 2pm, but remember that clocks go back Saturday night/ Sunday morning! The route is attached but as before, we’ll leave in convoy and when we get back, they’ll be hot food available. It’s due to be a bit chilly on Sunday, so wrap up warm and we’ll see you there! 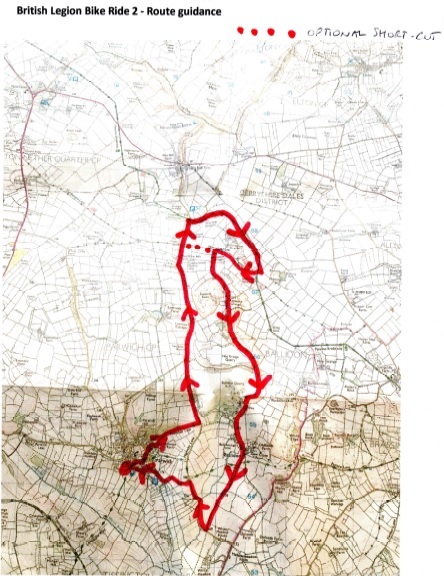 Details of the route and the a map follow – please click on either to enlarge.